It seems rare but refreshing to find a sports fan who prefers to follow his chosen sports – quite a few in his case – via the radio and not as much by television. 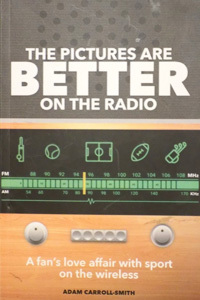 The title of Adam Carroll-Smith’s book, The Pictures Are Better On The Radio, may give an indication of where his loyalties lie and the book makes for amusing reading whilst extolling the virtues of listening to rather than seeing the sports action. I have heard of quite a few sports followers who have the Test Match Special commentary on whilst simultaneously watching the cricket on the television, naturally with the sound turned off. The art of radio commentary must be in marked contrast to the television. On the one hand, the radio commentator has to keep going whereas, I have been told, the television commentator must allow at times the action to speak for itself so, on occasion, it is better to say less. I can fully relate to Adam’s tales of finding out the score. We too had illicit radios at school with the ear piece threaded up through the jacket pocket and having the score relayed whilst propping ourselves up on one elbow all the while trying not to look disinterested. Adam is quite a bit younger than me and I hope that he will forgive me if I do not properly understand some of the more technical words which he uses in the book. I find that a further benefit of the radio commentary is that, unlike the television, repeats cannot be shown with such regularity that it becomes draining waiting for the live action to continue. Adam’s reminiscences are interesting and varied. His main sporting loves are football and cricket but athletics, golf and tennis also feature within this fun book. In his amusing way, Adam makes a very entertaining case for listening to sports commentary by radio and I am sure that many radio commentators and fans alike will enjoy The Pictures Are Better On The Radio.